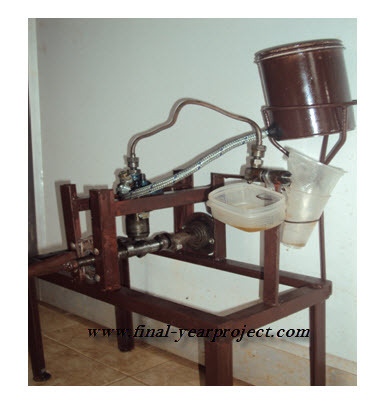 This is a good Mechanical project report on Fabrication and Working Model of Fuel Injection Pump. 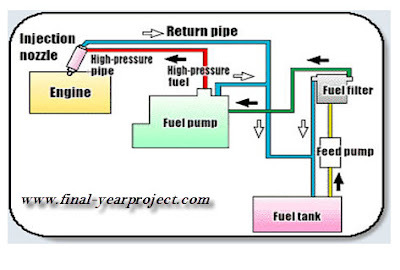 This project is about single cylinder fuel injection system in diesel engine. The fuel injection system of diesel engine consists of fuel filters, air cleaners; fuel feed pump, fuel injection pump ,fuel injector, and fuel tank. The main components of fuel injection systems are Fuel tank, Fuel feed pump, Filter, Injection pump and Injector. You can also Subscribe to FINAL YEAR PROJECT'S by Email for more such projects and seminar. The quantitative calibration of fabricated model using single jet nozzle has been made in this project. The report focus on diesel fuel injection pump, fuel injector,fuel feed pump and there working. Use this report for your reference and study work only.